Thanks for visiting Redding Pool & Concrete Design! 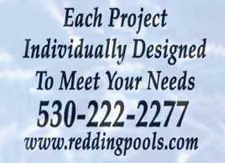 Thank you for visiting Redding Pool & Concrete Design. Please feel free to contact us about anything on our Web site by clicking below. Come back and visit when you can and be sure to tell a friend about us!